These hunters have become the hunted on the Jungle Cruise ride. 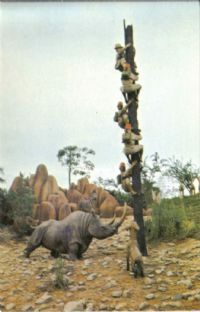 Rhinos chase them up a tree in this WDW view card # 01110208. Card has brown printing with Florida flag back. Card is unused and mint!